The trip on the ferry was uneventful, however the swell made a decent sleep difficult for us. The ferry docked in Kristiansan on schedule and we were one of the first out. I managed to get totally confused and had trouble finding the van as the doorways are marked as emergency exits. At least Pieter was there to take the van off on time. This is about the only thing DFDS Ferries could improve upon. First impressions of Norway are magnificent, clean, tidy, lakes everywhere, trees and rocks everywhere, fields in every available slightly flat spot, wooden houses built off the ground, lots of areas for walking, climbing, fishing and boating, a very hot sun until at least 8pm, cold nights and clear air. 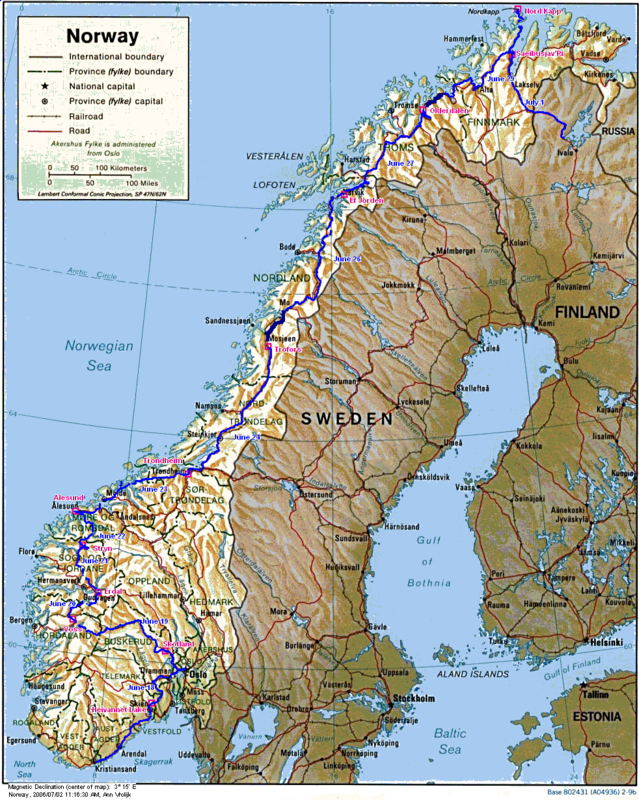 The road to Oslo is a feat of engineering. At one point we went through a tunnel to exit in the middle of a cliff, cross over a bridge into the middle of the cliff on the other side of the water and through another tunnel 2.2 kilometers long. We spent two nights near Siljen on the way to Oslo, to catch up on our sleep and washing. There is a campsite nearby but we could not communicate with the manager and it seemed very expensive, probably just poor communication. We went a little further and found a large gravel area used by locals to park their cars before going for runs or cycles through the forest. The sun sets at 11pm. Relaxed after our day of rest we headed for Oslo. The main pedestrianised street, Karl Johans Gate, was abuzz with activity. Naturally we had coffee and cake. I had a Norwegian traditional cake called Kvef Jord made with meringue and a sweet filling. The marina held thousands of boats, a virtual forest of masts. There must be at least one sailing boat for each family. Oslo is not really a city for tourists, although there were many there. One noticeable feature was the slimness of the people. We did not see one young girl in hipsters with a belly hanging over the belt. Such a nice change from Britain. We stayed the night in a secluded spot on the Skotland river with the music of some rapids in our ears. The hot weather seems to have gone, it rained gently all day. This did not stop us from enjoying the scenery though. The road went over a watershed and up to 1240 meters high. This is not all that high but in this latitude it is above the tree line. The tundra is deep uneven ground covered with mossy vegetation where water seeps through in narrow channels heading for the lower ground and eventually joins others to make a fast running stream. There was plenty of snow around and ice on the still water, too small to be called lakes. There were no people and no sheep. It was magnificent. Right at the top there was a tourist shop, naturally! It was completely covered in earth for insulation. Coming down the road goes through a 3 kilometer tunnel twisting and turning to drop about 300 meters through mountain. Then there was a ferry across the Eidfjorde followed by an 8 kilometer tunnel. The tunnel walls are often the actual bedrock, occasionally covered with large rubber matting or gunite. The scenery today was imposing, majestic and varied. Our route took us over part of the "Norway in a Nutshell" route then onto tundra. Our first foray off the main road was to drive up to Stalheim. The road was constructed in 1909 and was considered a major engineering feat at the time. It was full of twists and turns. On the way up we could see the Tvinderfossen falls and at the top there was a magnificent view over a very narrow valley. The farms were all nestled along the river at the bottom, along with the road and railway line. We came down the other way, the route used by the tourist buses, much easier! Back on the main road, we went through the valley to the Noeroyfjord, an arm of the Sognefjord. It narrows down to 250 meters at one point and we were there when a tourist boat came past. The colour of the water is a deep green, sometimes blueish. It is impossible to capture on a photo. Next came an 11.4k tunnel through the mountain and more fantastic scenery looking over the Aurlandsfjord. We were tired of tunnels by now and decided to take the old road over the Blaskavlen instead of going through the worlds longest road tunnel of 24.5k. The tundra on the top was again magnificent. There was a lot of snow, waterfalls and iced lakes. The colours of the frozen water are amazing, light blue, dark blue even some green, beautiful. We spent the night in a parking area near Erdal on Ardalsfjorden. We were eventually joined by 5 other mobile homes. With everyone seemingly wild camping I do not know how campgrounds make a living. They do provide self catering huts though. It rained quite heavily all night and today started the same way, terrible weather. We could still see the scenery though, although photography was out of the question most of the time. The day started with a ferry ride from Fondnes. We looked across the water and could see the landing point but no road. That is until we saw the tunnel entrance. There is no open road, you come off the ferry and into a short (already I am getting blasé) 3 kilometer tunnel. If you need expert tunnel builders get Norwegians. The mountains around the Jostedalsbreen (Jostedals Glacier) were dramatic, very high with steep sides, something like upended ice-cream cones. They go straight into water and provide very little living space. Some Norwegian houses have turf on the roof for insulation, although most have tiled rooves. The walls are made of wood. They are usually 2 stories, built above the ground with a basement underneath. There is almost always an open balcony with chairs. The gardens a minimal, usually mown grass and occasionally a Lilac or other tree. There are pots though filled with bright annuals or pelagoniums. We spent the night by the side of the road again, overlooking Noordfjord. Again the scenery was magnificent. We went past a ski resort with huge floodlights, presumably so that people can ski on dark winter nights. After spending hours looking for a laundromat in Alesund we stayed in a campground, washed and dried the accumulation of clothes and had a lovely hot shower.. It rained again today, but the scenery was stunning. We wove through U shaped valleys gouged out of the rock by glaciers eons ago, waterfalls pouring down the mountains to join the river meandering through the valley below, fields of hay, some green and lush, others already harvested, red, brown, orange or white houses, then onto a fjord with patches of fields and houses close by the water and tall mountains rearing straight up behind with the tops obscured by the rain clouds, small harbours with their forest of masts and trees everywhere, fir, pine, larch, spruce, maple, elm and birch. King Olav Haraldsson who fought to bring Christianity to Norway is buried at Trondheim. He was given sainthood and his grave became a place of pilgramage, hence Nidaros Cathedral was built. It is the site of all Norwegian Coronations and contains the crown jewels. It rained as usual, however we managed to do quite a few kilometers under our belt. The landscape has become flatter (for Norway) and there are not quite as many twists and turns in the road. Even though the scenery is not as spectacular as in the south it is still very beautiful. Sunday was spent doing admin. Today we crossed the Arctic Circle. The area was flat and treeless, bleak, and we, wrongly, assumed that this is how it would continue northwards. Naturally Pieter had to show how hardy he is, especially as there was a few tour busses with everyone huddled into coats. I am standing in front of an example of Norwegian Rose Marble which comes from Fauske just north of here. What can I say? The scenery continues to be magnificent. There are still many varieties of trees, however Birch predominates and the ground is covered in mosses and ground covers. The Birches have misshapen trunks, presumably from the weight of the snow when they were young. In fact we believe it was snowing on the high peaks. We found a beautiful secluded spot to camp and in the morning the sun was shining so we stayed the day. And this is in the Artic! The sun was very hot, but the wind had a nip in it and it was cool in the shade. We watched the sun go round high in the sky, it did not appear to come lower but stayed at the same height. The northern most point of Europe is on an island reached through an 8k tunnel under the water. There is an extensive tourist facility with restaurants, souvenir shop, memorials of past visitors, Children of the Earth monument and of course the globe symbolising the North Cape. We watched a movie with a 180 degree view of the area, the flowers and animals in the area and of the northern lights. Beside mobile homes and tourist buses there were a lot of cyclists on the road with all there belongings attached to the bike. Now that is adventurous! The sun was shining when we arrived at Nord Kapp, paid our admission fee and found a place where we would stand (almost) level amongst about 50 mainly campervans. During the night we felt the van rocking in the fierce wind that brought sheets of rain and thick mist. In the morning we couldn't see a hand in front of our eyes. Most campervans left on their way back to warmer places. We stayed until lunchtime when the weather cleared and it was not so dangerous to drive anymore. Tomorrow we will be in Finland. NB: Wild camping is acceptable and we only spent 1 night in a campsite. There are specific places in parking areas to dispose of the contents of the chemical toilet and to fill up with water.